Collagen Apple Pie — Welcome to Fitty Foodlicious! Apple Pie Season is here! The holidays are in full swing and it's time to break out all of the Pie-riffic recipes for winter! (See what I did there?) 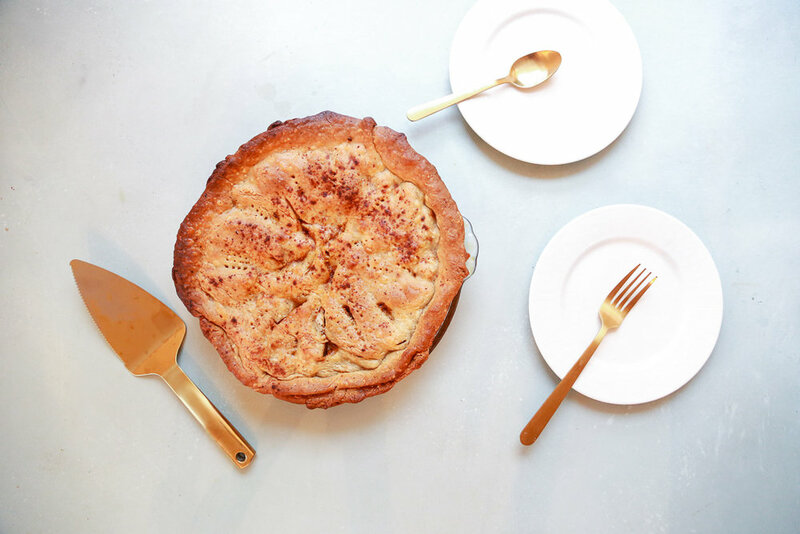 Apple Pie is the perfect addition to any meal, but really the perfect meal at any time of the day! I remember the first time I had apple pie. It was around Christmas time and we were living in Minnesota at the time. It was freezing cold and I was spending the holiday at my Grandparents house. My grandpa and I were watching boxing (something we did pretty regularly) and my grandmother came into the den with this giant tray of apple pie slices and vanilla ice cream. Remember back in the day when people had den's in their homes? If you're an 80's baby like me, then you know what I'm talking about. One look at that apple pie and I was hooked! My grandmother made the classic version with a delicious apple crumb crust that was tasty and just sweet enough. 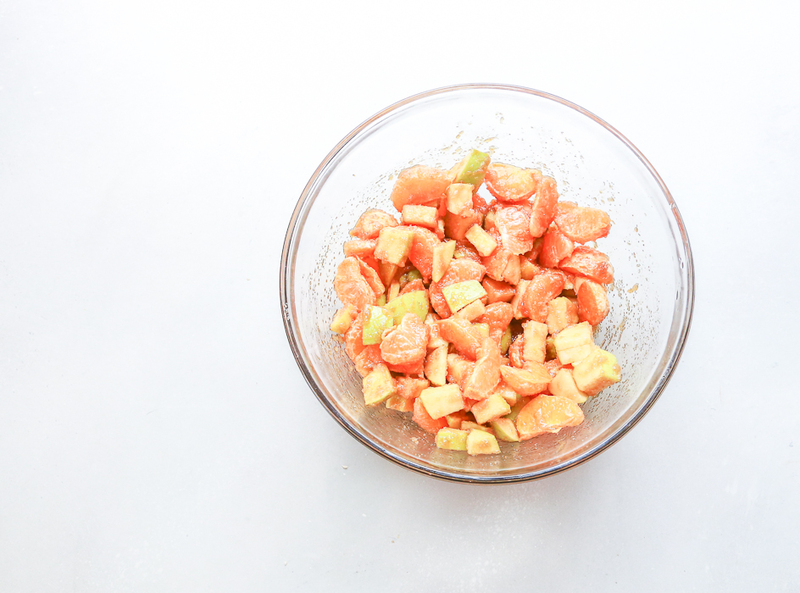 I've since added my own twist to her classic recipe, adding in mandarin oranges and using various types of apples like granny smith and Honeycrisp apples. I promise this recipe does not disappoint! 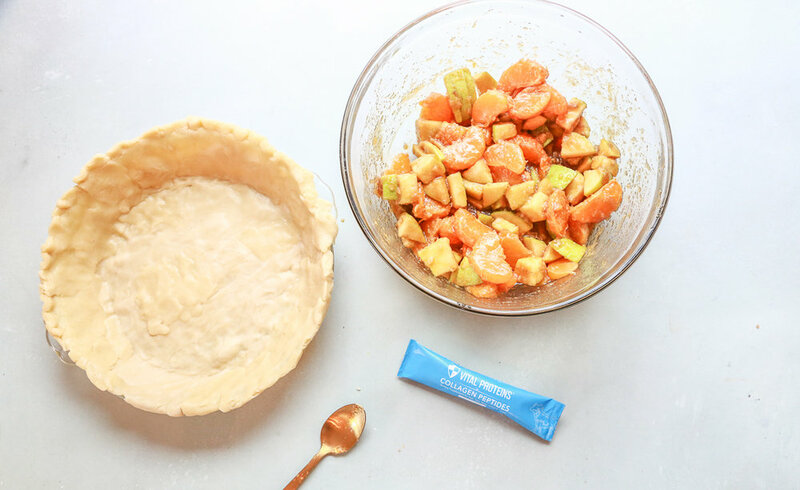 My Collagen Apple Pie packs a healthy punch too with 20-grams of added Collagen using Vital Protein's Collagen Peptides. I've also snuck in a secret ingredient into my pie and that's Mandarin Oranges! Mandarin Oranges may sound strange to you, but they are actually delicious in apple pie. 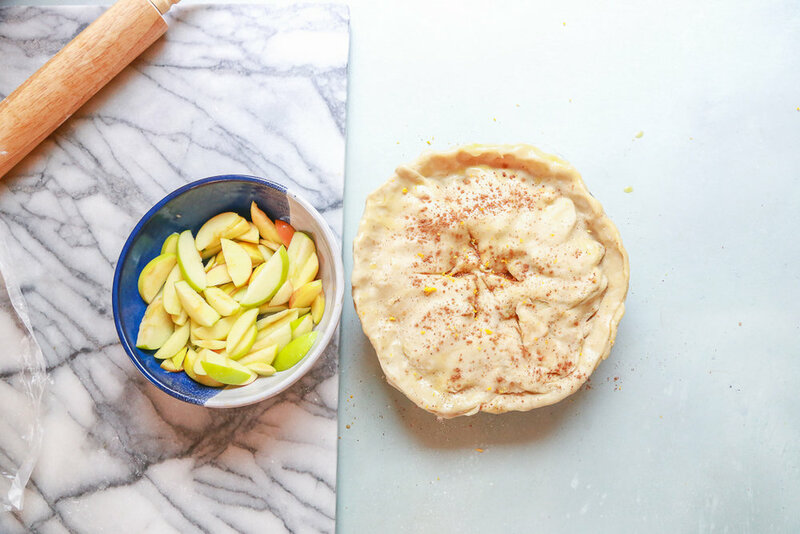 They give the pie a vibrant citrus flavor that compliments the apples quite well. As you can see I also don't peel the apples in my apple pie. I prefer the skin on them and leaving the skin on the apples also gives you more nutrients in the end. 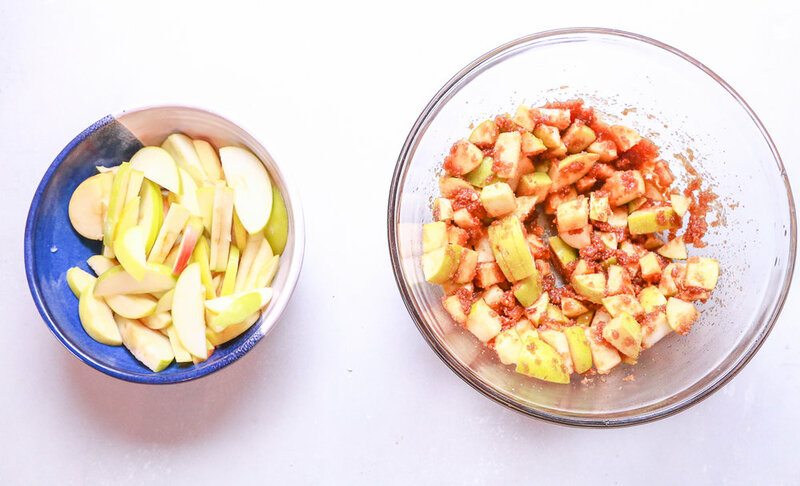 However, if you prefer peeled apples, go ahead and add that step to the recipe, either way, will taste delicious! I get asked a lot about the why I take collagen and what the major benefits are from taking it. 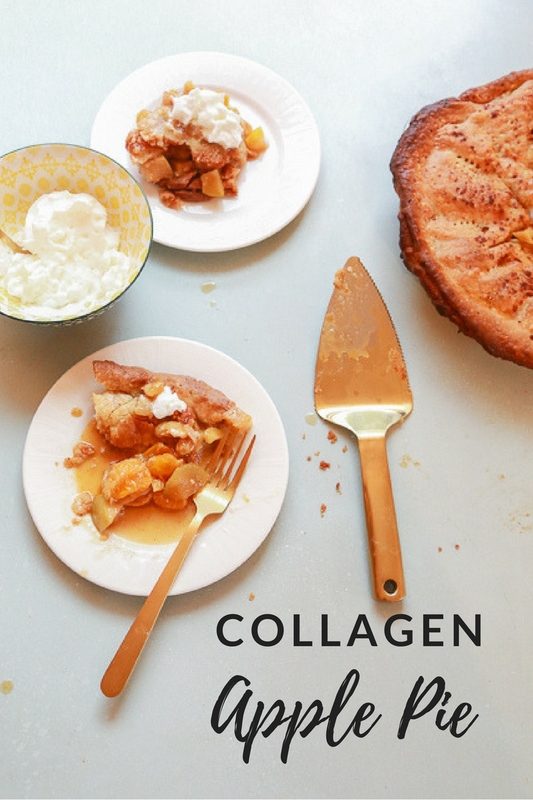 The main question I get is, "Why should we take collagen when our body already produces it?" The main answer is, because as we age our bodies produce less and less collagen over time, causing our collagen production to diminish over time. Supplementing with collagen helps prevent more collagen from diminishing and helps our bodies build more collagen. I also take collagen to help my hair, skin, nails, protein levels, and energy levels. Since I've started taking Vital Protein's Collagen Peptides my hair grows crazy fast. And I mean crazy fast! I just got my hair cut two weeks ago and it's already growing out again! My nails are super strong, so strong that I don't pay for fake nails anymore. My skin is clear and my hormonal breakouts happen less and less. I wake up with more energy and I recover from my workouts faster. I love taking collagen and will continue to do so because it's been monumental in my overall progress! Plus, Vital Protein's makes so many delicious collagen flavors that the possibility are endless. My top two favorites are their Vanilla and Blackberry! 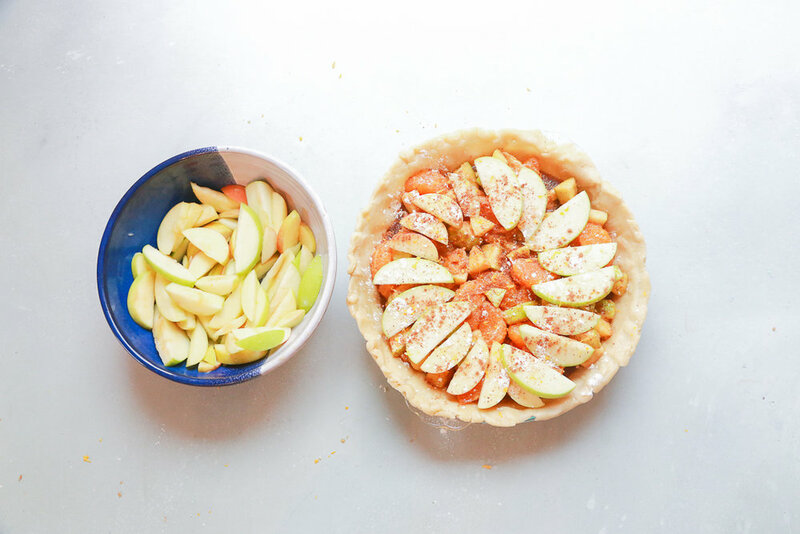 Check out my full recipe below on this delicious Apple Pie and let me know if you guys make it in the comments section below! Do you prefer your apple pie with whip cream or ice cream? I love a big dallop of fresh, homemade whip cream on top of mine. Yummy! Preheat oven to 350-degrees Add sliced apples and brown sugar in a mixing bowl and combine Next, add the mandarin oranges and combine Add the melted butter, honey, collagen peptides, vanilla extract, pumpkin spice, nutmeg, and cinnamon and combine Once everything is combined add it to your pre-made pie crust and then add more apple slices to the top of the pie. Add a dash of flour and more cinnamon to the pie before putting the top crust on. Carefully fold the top crust of the pie over the pie and pinch on the sides to form a crust. Put the pie on a baking sheet and bake for 45-minutes at 350-degrees.